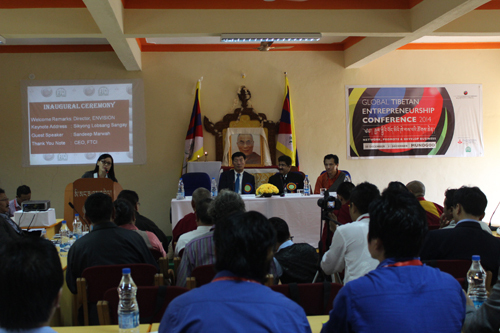 (TibetanReview.net, Jan02, 2015) – The head of the exile Tibetan Administration at Dharamshala, India, Sikyong Lobsang Sangay on Dec 30 assured full assistance and support to Tibetan entrepreneurs for the overall economic development of the Tibetan community, reported Tibet.net Dec 31. He gave the assurance at a two-day Global Tibetan Entrepreneurship Conference held at the Mundgod Tibetan Settlement, Karnataka State. More than 50 Tibetan entrepreneurs from Nepal, India and Europe took part in the conference which was jointly organised by Empowering the Vision, a New Delhi based Tibetan NGO, and the Federation of Tibetan Cooperatives in India. Recalling the Dalai Lama’s address to Tibetans in Washington DC in 2014, in which he said that there should be Tibetan millionaires and billionaires as well, the Sikyong called for the establishment of small-scale industries to build Tibetan entrepreneurship from the grassroots level. He also reminded the Tibetan entrepreneurs about their social responsibility. Mr Sandeep Marwah, the Chairman of the International Chamber of Media and Entertainment Industry, was reported to have attended the conference.